J.E. Buttersworth was born in England in 1817 and was the son, and student, of Thomas Buttersworth (1768 – 1842) – the well known British Marine artist. During the 17th, 18th and early 19th centuries England developed one of the world’s greatest naval fleets and having engaged in many wars, created much naval history that needed to be recorded. The artists of these periods were commissioned to portray the great battles for the people back home. By the time James started his career, England was at peace and there were a number of excellent marine artists looking for work … most now painting general shipping and yachting scenes, along with the occasional ship portrait, to earn a living. By 1847 James decided to move, with his family, to American – feeling that his future would be brighter there. Upon arriving in America he met Nathaniel Currier who, liking his work, gave him a small commission; this would be the first of many he would receive from his firm – Currier and Ives. James settled with his family in West Hoboken, New Jersey and set up a studio in Brooklyn. In 1850 he exhibited his first work at the American Art Union and sold five paintings. From this point his popularity as an artist grew and he was soon to become one of America’s greatest maritime artists. James died in New Jersey on March 2, 1894. 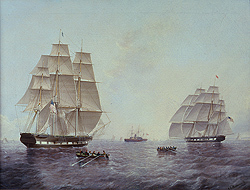 Examples of his work can be found in most important collections of American Marine art and in the following museums: U.S. Naval Academy Museum, Annapolis; Bath Marine Museum, Maine; Newark Museum, New Jersey; The Museum of the City of New York, New York; The Atwater Kent Museum, Philadelphia; Virginia Museum of Fine Arts, Richmond; and the Peabody Museum, Salem, Massachusetts to name a few.